The quilt retreat I go to is at a Lutheran camp on Lake Coeur d'Alene in Idaho. A beautiful setting that often is ignored as we focus on our sewing. The rooms used for the retreat all have views of the lake though. For the second time we were up in the chapel instead of the room underneath. This is a great space with lots of natural light during the day and lots of space for laying out quilts. The one downside is that we didn't have the sitting area with couches handy for hand sewing so since I had a good bit of hand sewing to do I didn't get as much of that done as I would have liked. I did get a lot of machine sewing done! Besides the little folded fabric bags! I had quite a few projects packed in my bins and baskets. Probably the one I most wanted to complete was the girl baby quilt for my niece's baby that was born in December! I had everything I needed to get the top done, or so I thought. I had the main part of the top done and then realized I didn't have something for the narrow inner border and knowing I had to have something I could use at home I wasn't going to drive into town to find something that would work. So, that was set aside and I pulled out the fabrics left over from this quilt. I happened to notice the bin with them in as I was packing to leave and figured this was a great time to make a beach wall hanging and get the rest of the fabric put away when I got home. 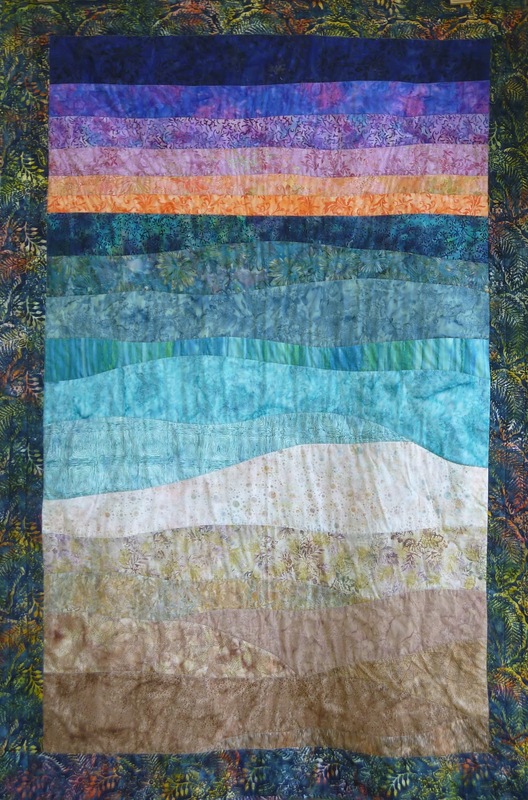 I love these type of quilts. Once you have the fabrics chosen it goes together so quickly. I had the wall hanging top finished in about 2 hours. I even had enough fabric for the back! I moved on to my carnation quilt (fabrics show above on left). I received some of the fabrics from my sister for my 50th birthday over 3 years ago and then another piece from my husband for the same birthday and then I found a few more pieces still in shops. Last March at quilt retreat I got the center of the quilt finished (and didn't take pictures) but wasn't sure about the borders. I had lots of leftover half-square triangles I thought I might use for the border but I just wasn't up to pressing and trimming all of them so it was put away until I saw it as I was packing up and decided to bring it along. I got all those triangles trimmed but when I laid out the quilt, I realized I didn't want to use them for the border, it would just be too busy so I went with first a narrow tonal and then a print for the borders. I decided I would use all the triangles as part of the back along with the leftover fabrics. I got most of the back together but just didn't have enough fabric with me so that got put aside also. I also brought along most of my leftover triangles and did a bit of sewing on those when I just wasn't with it enough to make major decisions. Yesterday I got the baby quilt top finished and the back ready, finished the carnation back and then got both of those pin basted along with the last frog quilt, the beach wall hanging and the Christmas crazy quilt. It was still too early to call it a day in the sewing room so I quilted the beach quilt and the carnations and got their bindings ready for hand sewing. Today I should be able to get the Christmas quilt and the baby quilt to the hand sewing point also. I would love to have them done for the quilt show along with at least one of the frog quilts. Maybe tomorrow I will have some pictures of finished quilts.